From Alziari in Provence, our long-time source for one of our most popular olive oils, comes this set of four miniature bottles. There are two extra virgin olive oils: one more fruity and peppery, one more gentle and buttery. There are also two vinegars: one cider, and one red wine, both aged in oak barrels. 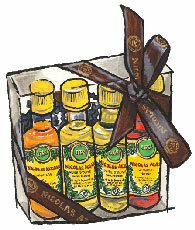 The four bottles are nestled in a clear box and tied with a ribbon. They make an adorable small gift for someone looking to mix up their vinaigrette game.